Freemium. Customizable. The original Iris. Awesome for Health freaks. Iris is software for eye protection, health and productivity. There are several different modes and several different types of Iris. These are basically some preset values that many people use. Aside from this you can customize Iris a lot. I know that it can be a little hard for non-technical people, but I’m doing my best to make it as easy to use as possible. By default Iris works automatically and detects if it’s day or night. Based on that it will change your screen Color Temperature and Brightness. When you open the control panel of the program you can select different modes and types of Iris. If this is still so hard for you, try Iris mini which is a smaller version of Iris with smaller size and lower CPU usage. Both Iris mini and Iris are free, but there are some Pro versions with more features, because I work on Iris full time and want to make it a sustainable business for me. This is my passion and my dream. Some of the benefits of Iris over competitors are that Iris works even on docking stations and monitors connected with USB with the help of my custom High level Color-API. It has a much larger blue light reduction color range compared to all other alternatives, brightness without pulse-width modulation, manual settings, color effects, font rendering, magnification and partial screen blue light reduction with the help of full-screen overlays. If for some reason you don’t like Iris you can check f.lux, Twilight, Night Shift, Night Light and Redshift which are some nice alternatives for blue light reduction. For the brightness and different color effects I don’t think there is another alternative, so you are stuck with Iris. It’s important to preserve our vision so even if you don’t use Iris I will still be happy. 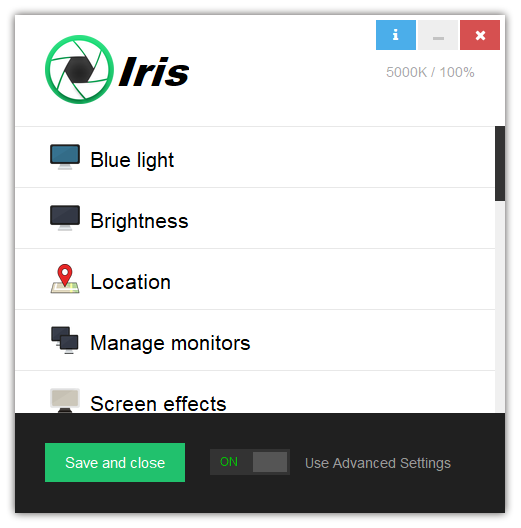 Iris has a free version that you can try. You can also buy a lifelong license for Iris for $15. More about the licensing here.